All transactions are safe and secure with a reliable history in online purchasing behind each of our associates. 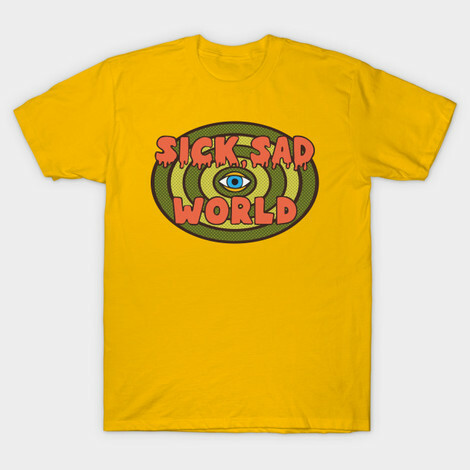 Buy the Sick, Sad World t-shirt to own Daria clothing and merchandise. One of Daria and Jane's favorite pastimes is watching the TV show Sick, Sad World. It has off the wall stories like, "He's risen from the grave... and he still won't pay child-support! Undead deadbeat dads" and "Guano see some gutsy climbing? Scaling the world's tallest pile of seagull droppings". If these sound like they would interest you then perhaps this Sick Sad World t-shirt will be right up your alley as well. If not, keep perusing our Daria clothing and merchandise options. In addition to the Sick, Sad World tee above, browse the Daria Clothing Gallery for more apparel like men's and women's clothes, kids shirts or hoodies.